« Melting snows on Mt. Kilimanjaro are not evidence of global warming. 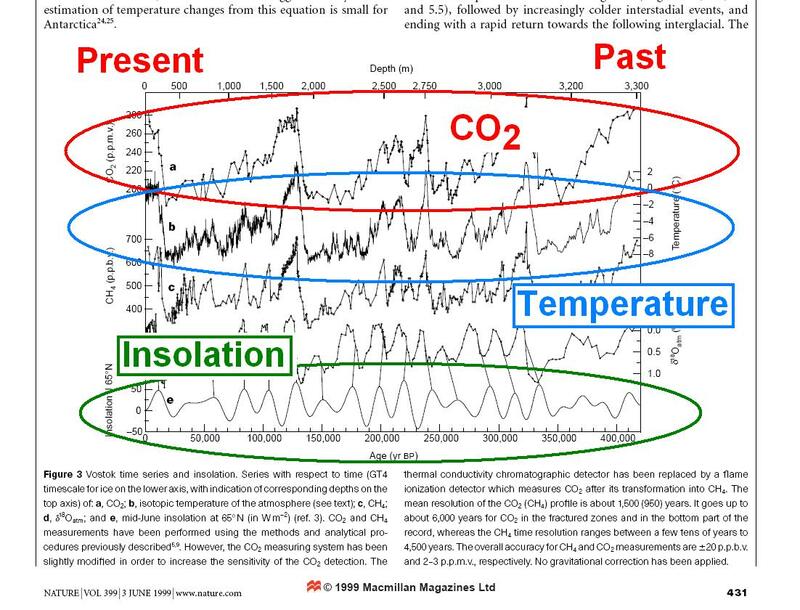 In the very compelling graph from “An Inconvenient Truth” shown below in figure 1, Al Gore shows the close correlation between CO2 and temperature. The implication is clear: the temperature increase is controlled by the CO2 level. His simple model is illustrated in the block diagram in figure 2, but one is left wondering what controlled the level of CO2 before humans started burning fossil fuels. Figure 1. Al Gore showing temperature and CO2. The present is on the right near his head and the past is on the left. Figure 2. 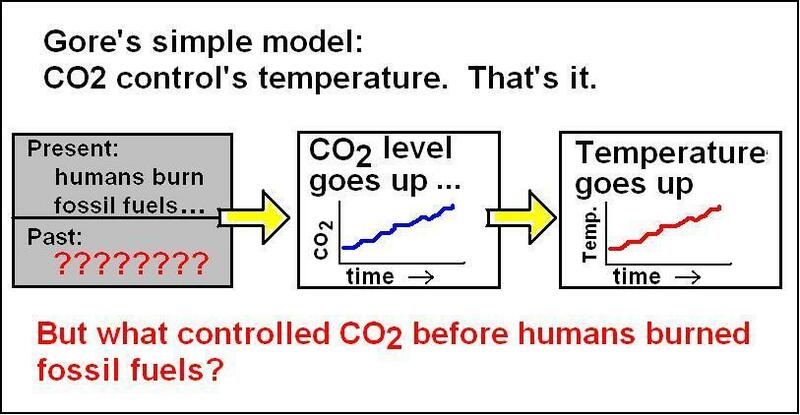 Gore’s simple model is: CO2 controls temperature. Nothing more need be said. But what controlled the CO2 before humans burned fossil fuels? Gore is an advocate for a certain point of view, not an objective scientist, so perhaps he can be forgiven for leaving out a fundamental point concerning this relationship. That point is illustrated below in figure 3, which shows part of page 431 from the journal Nature, 3 June, 1999. The article is “Climate and atmospheric history of the past 420,000 years from the Vostok ice core, Antarctica” by J. R. Petit, et. al., (scientists from France, Russia, and the United States). The graph in figure 3 shows the same data that Gore is standing in front of in figure 1, plus several other things that Gore doesn’t show. 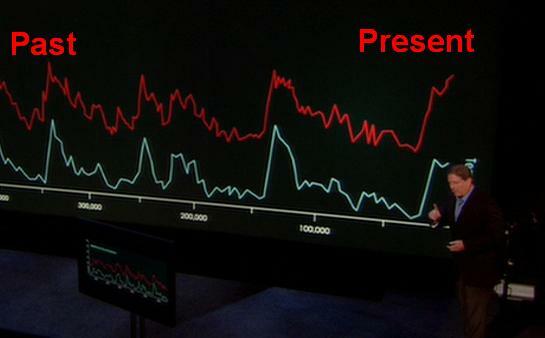 Please note that Gore’s graph shows the present at the right and the Petit paper shows the present at the left. On Petit’s graph CO2 level is circled on top, temperature is circled in the middle of the graph, and the insolation at 65 degrees latitude is circled at the bottom. Figure 3. Graph from Petit paper showing CO2 and temperature (same as Gore is showing in figure 1) and insolation (which Gore apparently forgot to show). Note that the time direction is reverse between Gore’s graph and Petit’s graph. The most important thing that Gore does not show is the changing insolation pattern. Insolation is the amount of light from the sun that shines on a particular place. It is important to understand that neither the temperature nor CO2 level can influence the insolation. According to Andre Berger, in the Journal of Atmospheric Sciences, the source for Petit’s insolation data, the insolation is primarily governed by “the eccentricity, the longitude of the perihelion, the precessional parameter and the obliquity” of the Earth’s orbit. If there is any correlation between the insolation and the temperature, or the insolation and the CO2 level, then the insolation must be driving the correlation, not the temperature or CO2. Figure 4, below shows my digitized version of the temperature and CO2 level over the last 150,000 years from the Petit (1999) paper. This time period covers the current interglacial (warm)period, the previous ice age, and the interglacial prior to the ice age. Compare the data in figure 3 with Gore’s data in figure 1. They are, in fact, the same (although I show the unsmoothed and smoothed temperature, while Gore shows only his smoothed temperature). Figures 5 through 7 show the temperature, CO2 level, and relative ice volume each compared with the insolation for the last 150,000 years. Figure 4. Digitized version of data from figure 3 or Petit, et. al. (1999). I have included the unsmoothed version of temperature data overlaid by a smoothed version. Gore shows only a smoothed version. See text below for explanation of relationship between deuterium isotope ratio and temperature. Figure 5. Temperature at Vostok, Antarctica and insolation at 65 degrees north over the last glacial – interglacial cycle. Insolation, the magnitude of solar radiation, shown here as a deviation from an average. Both sets of data are digitized from figure 3 of Petit’s (1999) paper. Figure 6. CO2 at Vostok, Antarctica and insolation at 65 degrees north over the last glacial – interglacial cycle. Both sets of data are digitized from figure 3 of Petit’s(1999) paper. Figure 7. Ice Volume and insolation at 65 degrees north over the last glacial-interglacial cycle. Ice volume is digitized from figure 2 of Petit’s(1999) paper. Early in Gore’s movie and book he relates an anecdote about his sixth grade classmate who, upon seeing a map of the Earth, wondered whether or not South America and Africa once fit together. The teacher responded “Of course not! That’s the most ridiculous thing I’ve ever heard!” Gore says “That sixth-grade teacher had an assumption in his mind that he didn’t bother to question: Continents are so big, obviously they don’t move.” The moral of the story being, of course, that the CO2 and temperature graphs do fit together and an unprejudiced child can see it. I wonder what Gore’s classmate would say if he saw the two side by side graphs of figure 8, below. It is clear that in the relationship between CO2, temperature, and insolation only insolation can be the primary driver. According to Andre Berger, in the Journal of the Atmospheric Sciences, Insolation is controlled by the “eccentricity, the longitude of the perihelion, the processional parameter and the obliquity” of the Earth’s orbit. Hubertus Fischer (1999)(Scripps Institution of Oceanography) wrote about Ice core records of Atmospheric CO2 Around the Last Three Glacial Terminations, in the Journal Science and concluded “High resolution records from Antarctic ice cores sow that carbon dioxide concentrations increased… 600 ± 400 years after the warming…” That is, as the last three ice ages ended and temperatures started rising, the CO2 lagged behind the temperature rise, indicating that CO2 was not the primary driver of temperature rise. 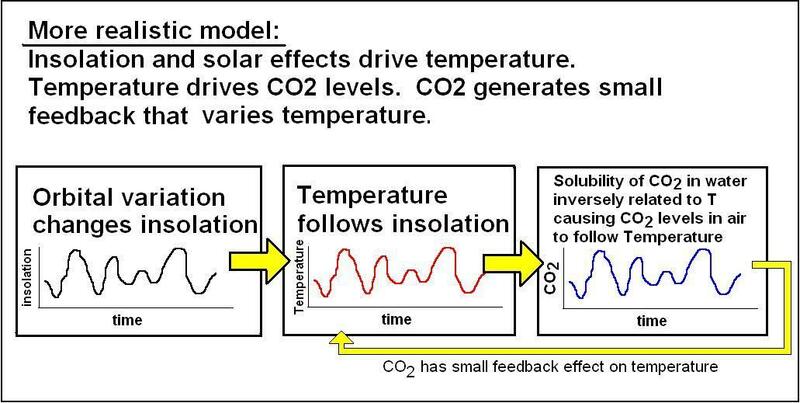 My interpretation of the papers by Fischer, Mudelsee, and Stott, as well as the correlation between insolaton, temperature and CO2 suggest that Gore’s simple model is better replaced by the more realistic model shown in figure 9, below. Figure 9. This model is more realistic than Gore’s. It does not start with a mystery about what controlled CO2 levels before humans started burning fossil fuels. Insolation is the primary controller of temperature. Temperature controls CO2 with a small feedback. Gore’s graphs are suspect across the board. In one scene from the movie, the CO2 line actually goes backward in time as it increases. Here is a picture of the amazing abilities of CO2. I just wondered if you’d noticed that in figure 5 the insolation falls but the temperature continues to rise, there is clearly a strong correlation between insolation and temperature, but to suggest it as a primary factor in an attempt to dwarf the effect of CO2 (which clearly shares a strong correlation with temperature aswell) is ridiculous. But not nearly as bizzare as your ‘present day’ data for CO2 in p.p.m, which you have at around 290, while the actual statistic is accepted to be just coming over 380… I thought you might need to add that to your graph to allow you to reevaluate the evidence. The co2 in an ice core sample does not correlate 100% with co2 in the air. But I agree it seems like the extra co2 in the air is preventing US from going into an ice age. If we stop producing co2 will the temperature start to drop quickly? Thank you for comment and observations. Please note that the insolation shown here is for 65 degrees north latitude. The latitude is noted in the caption of the image from the original Petit paper (double click on figure 3, above, to be able to read the caption), for a reason. At other latitudes the peaks and troughs (the phase) could be offset by thousands of years. This because the average insolation distributed over the planet does not change all that much, but the relative distribution does. A phase offset can for insolation can be seen ever more clearly in figure 7, which shows the ice volume and the insolation. Your observation about figure 5 is correct. But I think figure 4 holds a more interesting relationship. Notice that in the Eemian (the previous interglacial, about 120,000 years ago, that the CO2 level remained more or less constant while the temperature fell, following the insulation. The level of CO2 shown in all of my graphs comes directly form the ice core data reported by Petit. This is the same data that Gore used. The fact that the CO2 level is about 380 ppm today makes my point all the more clearly. Why? Because the Holocene (the current interglacial) clearly saw warmer times in the past(see here for example), when the CO2 level was 290 ppm or even lower. Isn’t it quite obvious that Gore concealed a large part of the story, that is, the insolation, when he told his tale of the relationship between CO2 and temperature? Quite frankly, I think it was just a plain dishonest omission. Hey I really like your thoughts of Global Warming! I am a twelve year old who was watching your moving in Science Class. We are learning about Global Warming right now. I never new how big an effect I can make. i always thought well what could one person do to help? Well after listening to your movie, I thought what if everyone thought that. Then we really couldn’t do anything. You charts are very dramatic and powerful!! They opened my eyes very wide and my ears to listen to the true Inconvient Truth! I want to see these graphs held up along with time series graphs of sunspot activity. See which fit better. As an amateur, I do not wish to argue the science with you, and I can see your point that Al Gore has a biased view and ‘may’ have doctored his evidence to emphasize his point, but surely you’ve missed the thrust of his argument in An Inconvenient Truth; and that is simply that ‘We live here’. That is to say, we can see that climate change occurs (even your graphs show this to be the case) Whether the severity of the current change is man-made or not, anything that we can do to try and stop it progressing at a faster pace than Nature intends is now within our power and it is immediately necessary to carry those things out in order to decelerate the exponential and irreversible effects. We may not be able to stop or reverse the effects, but we may be able to delay their progression by taking action. If you look at his film from this perspective, and remember that he is a politician and not a scientist, you will see that he is trying to show the problem and provide impetus and support for a solution. Picking apart his data is really missing the objective of his rhetoric. His figures on the population explosion in the last 70 years are quite telling; I’m sure his skeptics would find fault with them too. It is however, undeniable that the Earth’s population has grown over this period, and if it is possible to see the difference a small human habitation in a previously uninhabited environment can make, I ask you, what does the extensive population spread; increased use of land for agriculture, farming, industry and towns as well as the increased longevity in the western world over those last 70 years all add up to? It must have had an effect of some sort – whether it is adverse or not I don’t know, and is debatable – Gore’s view is quite clear – but these effects should not be dismissed because ‘he has his own agenda’, his graphs ‘look suspicious’ or his figures are ‘speculative’. After all, ‘It’s where we live’ – skeptics and believers in his cause alike. That was one of the squishiest things I have ever read. You took a lot of words out of my mouth. I agree that Gore may have tailored his data to heavily support the notion of Global Warming, but why is he so keen on informing the public about the adverse effects? Because he is trying to get us to recognize that we need our planet to be healthy for us to thrive. Even is GW is a total hoax, as you said, increasing population IS NOT, water shortage IS NOT, deforestation clear land and resources IS NOT. And all of those problems are MANMADE and will have DIRE CONSEQUENCES soon than we expect. We need to wake up and move in a more sustainable way of living (cliche sure, but my Truth, yes). everybody wants clean air, clean water, etc. This desire does not make Gore or his arguments special is any way. The problem is that ruducing CO2 emissions to Gore’s satisfaction will sap the resources to do many other noble things, or to progress in general. The energy rich of the world enjoy better health, longer life expectancy and living conditions as a direct consequence of that abundant energy. If you care about the poor and struggling people of the world, the best thing you can do for them is build or maintain a system where they can advance to energy abundance. If we follow Gore’s vision, that will never happen. The arguments against climate change here all seem to be aimed specifically at Gore – he’s a straw man, and not the issue – scientific data that conclusively suggests climate change is the stuff we should be discussing. Besides, Gore has very limited potential to change things as they stand – he isn’t in a position to do that directly. Our energy dependance, if not tackled thoughtfully, will cause changes to the ecosystem that our species may not be able to survive (over the long-term, of course). You only have to look at the other planets in the solar system that currently experience the greenhouse effect in the extreme. Venus, for instance, has a global mean surface temperature of several hundred degrees centigrade. No amount of sunscreen is good enough for that situation! I agree that we do need to have an energy-based future – but we must be prepared to make some concessions if we are to continue to have that future without the negative consequences that have been predicted using the clear evidence gained over the last half a century. Cause and Effect cannot be fooled into acting in our favour! A second point I would contend is the following. You state Gore fails to provide a controlling factor for CO2 prior to humans burning fossil fuels. You therefore imply that there is now and was previously some form of ‘control’ required for CO2 to be regulated. ‘…One is left wondering what controlled the CO2 before humans started burning fossil fuels’. My question to this is: before humans began burning fossil fuels, why did the amount of CO2 need to be ‘controlled’ by anything other than the natural carbon cycle? First, when human population was substantially less than it is today, deforestation had not occurred and CO2 emitting industry did not exist, why would there need to be a specific ‘control’ of CO2? Is it not the case that the carbon cycle would have regulated carbon in all forms? Fluctuations would occur through the very nature of transforming the carbon from atmosphere to biosphere, pedosphere, geosphere and hydrosphere and these fluctuations would be due in part to the different times it took for the transformations, but also meteorological changes could have affected the growth of trees and plants too. This would increase or decrease CO2 presence in the atmosphere to some degree, dependent on season and conditions for photosynthesis, further reinforcing these fluctuations. Second, we have embraced industrial methods that convert carbon quickly from a solid form into a gas that is then released immediately into the atmosphere, foregoing the geological timescale and thus the inherently slow nature of the carbon cycle. Almost simultaneously, we have reduced the area of forests that were previously available to regulate the amount of CO2 in the atmosphere. Have we not therefore introduced an unnatural ‘rogue process’ into the cycle whilst also reduced the planet’s natural ability to regulate the process? If so, is it possible that the cycle can collapse if we continue or increase the production of CO2 in this manner, overwhelming the atmosphere with the gas that you concur has a feedback (however small you have measured it to be) into the temperature changes we are seeing? Morgan, where is this movie of his? I am unable to locate even a title. I think Morgan was a little confused when she wrote her comment. I think she was referring to Al Gore’s movie. Gore has a geopolitical agenda. He wants to come out on the top of the emerging NWO bureaucrat food chain. Basically having lost the national Presidency, he will settle for being President of the World. That is why he has no interest in science, i.e. what is factually correct, and will gladly participate in the internationalist thrust to have what is politically “correct” triumph over scientific truth. A Climate change Treaty achieves the important objective of weakening American sovereignty in preparation for the ultimate emergence of a Pancontinental Union. If there is any “carbon debt” owed, it is by the Third World to the developed countries. There cannot be too much Carbon Dioxide. The more the better. Being “oxygen” to plants, a higher amount of CO2 would mean more food, and faster reforestation of the earth’s primary oxgen tank, the Amazon forest. Suppose there had been a concensus among astronomers that a rogue ELE asteroid was on a collision course, thereby producing a panic similar that which Mr. Gore has been so successful at fomenting. But then one lone, non-academically stampeded dissident discovered, a la Richard Lindzen, some new, real, measured, satellite data (as opposed to models run against hypothetical guesses), proving that the feared celestial civilization exterminator was actually going to miss the earth by a comfortable margin. Would there not be a great worldwide cheer of relief at this most welcome news? That there has been no such response to the news that the threat of man-caused global warming is non-existent, tells us all we need to know about the current disgraceful geopoliticization of science. What you’ve done here is fail to account for the radiative forcing of insolation. In that you’ve created a straw man argument with regards to the CO2/temp relationship. The radiative forcing of insolation can only account for maybe 1C of the temperature range in the glacial-interglacial cycles. In the past insolation is well understood to be the initial driver of temperature change. The rest of the change in temp is related to feedbacks. Insolation raises temp -> raises CO2 levels -> raises temp -> raises CO2… etc until equilibrium is reached or insolation falls and the reverse trend starts. Gore, of course, didn’t go into all this detail. But the fact remains that CO2 is the single biggest player in the GHE (WV is a short term feedback to T). What is different today is that humans are introducing CO2 into the climate system at a much faster rate than the planet can absorb, thereby increasing CO2 concentrations in the atmosphere and the GHE. This is what AGW is. You say Climate Sanity creates a “strawman argument.” A strawman argument means a misrepresentation of the opponent’s (Gore’s) arguement. What is the misrepresentation? You don’t say, but the word “strawman” really sounds deep. I have read Gore’s book and seen his movie. Climate Sanity’s representation of Gore’s argument is spot on. Gore used the Petit data, and Gore never, NEVER, mentioned or implied the most salient point of that data: that the CO2 level and temmperature follow the insolation. You assert, without any proof, that only 1 degree C on the glacial cycle temperature oscillation can be attributed to insolation variation. Nonsense. The fact that the same ice core data shows the CO2 level lags the temperature on both the upswing and the downswing by on the order of a 1000 years makes your weak arguement positively limp. The logical pretzels used to counter this fact are more astonishing than convincing. If insolation “can only account for maybe 1C of the temperature range in the glacial-interglacial cycles,” then the temperature at the CO2 peak would not drop much, or at all, because “The Biggest Control Knob” would be set to “high.” Yet it does drop. I guess your control knob is not quite as big as advertised. As it seems that we cannot control/ affect the weather in the way as Gore may suppose( but cannot understand), then the billions that will be supposedly poured in to ‘managing’ co2 levels must instead be used to weather (for want of a better word) such times of climate change in warming or cooling ! We have, as history and archaeology tells us, experienced change, even very recently in our history, and we have suffered and flourished and every thing in between during those times! so it is important that our attention and money are put into that and of course OUR affect on more conservation issues,population growth and the third world etc! That is one particular control knob that is of a large size! regards to you for your informative info! Supreme arrogance of man to think he has any affect at all on this magnificent planet – that our planet “needs’ saving from our all-powerful massively potent and destructive impact, what a joke. Our human civilisations come and go (Atlantis here one day, gone the next), the planet’s ice age fluxes come and go. What of it? Doom and gloom prophecizing, panicking, polliticking and prosletising…what a dull way to spend a single life-time’s existence. The planet doesn’t need us to worry about it…it doesnt need our saving it – quite evidentially it’s got the upperhand on managing its ongoing self – it wipes us out if it needs to! So chill out and go have some fun – it’s why you came.